It’s my favourite recipe of overnight oatmeal! I really can’t get tired of this. I’ve been eating it at least once a week for like 3 months 🙂 your recipe is a winner! I’m so glad you enjoy it that much! 😀 It’s one of my favorites too–I just wish I could find good mangoes so I could make it more often! Have you thought about using frozen mango? I haven’t used frozen mango myself, but I’m sure it would work! Frozen mangoes work great. Love, love, love this recipe! I make a triple batch and have it through the week. I also add a little ground flax. Maybe 1T. I’m glad you enjoy it! I often add ground flax or chia too. It’s really versatile! Sounds MARVELOUS. I’ll do it. Why the Resealable container? does it need mega-sealing for it to ‘process’ overnight? if so, what else could I use to secure it so? Wow, just made this tonight and took a little bite- delicious. Hassle free to make, and makes a hassle free morning. One thing that I added and recommend if anyone is obsessed with these like me- Chia Seeds!! I put about 1 and 1/2 TBSP in with this recipe and it made the consistency very nice. Thank you for this simple and tasty recipe! I’m obsessed with this recipe! My husband eats it warm but I love it cold. I want to know where that jar is from? I want one!!! I’m blogging about breakfast this week, and found your recipe. I make overnight oatmeal with dried and fresh berries all the time, but can’t wait to try this flavor combo! I’ll use the sliced mangos in the jar because I’m a terrible mango peeler! 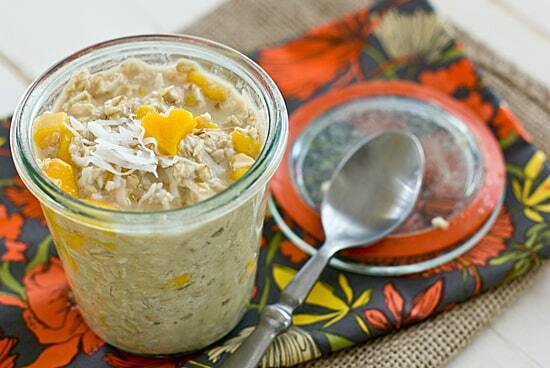 All if these overnight oat meals sound so amazing!! I can’t wait to try them. Do you eat them cold or heat them up in the am after the flavors developed? Thanks for sharing! How do you eat this warm. How do you heat it up. Heat it in the microwave or in a saucepan over low heat. I am going to make this tonight! Looks so yummy 🙂 May I ask where you got your silverware? That spoon is GORGEOUS and we’ve been on the lookout for some new silverware, but we’re pretty picky, so haven’t had much luck. Thanks in advance! They were a wedding present, so I don’t know if they’re still available, but they were from Bed Bath & Beyond. I can’t remember the manufacturer or the name of the set though! thanks for your comment on the TMJ, I had the same problem. Mangos are my fav fruit, so I always have a couple of cans of mangos in the pantry for when they are not fresh(better than going without, I figure). They are difficult to find. I will definitely have to try this combination, sounds good. Instead of adding agave to my oats, I just add some of the juice from the can of fruit. This recipe is going to the refrigerator today! I have made these a time or two now- I think I may have one-upped you on the coconut, though, and added toasted coconut. This was a great breakfast idea that felt like a bit of a food escape with those tropical flavors. Thank you! This was amazing, mine tasted like cake batter ! Wow! This is amazing. Just wondering, can I substitute with another fruit, mangoes aren’t in season right now where I’m from? Do we heat this up or eat it cold??? Just wondering can you make this for a week in advance? No, I wouldn’t make it a week in advance. I tried this recipe last night and had it for breakfast this morning. It was so good! I was pleasantly surprised by how good it was with so few ingredients. I used frozen mango ( I microwaved it before using it in the recipe to remove the ice). Instead of agave, I used 1/4 tsp of pure stevia. I will definitely be making this one again. Thank you! or the natural/raw kind from the frozen aisle? Oh how I love overnight oatmeal, especially in the summer after a morning workout! so refreshing and still nutritious! Can i use honey instead of agave nectar? We haven’t tested it with honey, but it seems like it would work since they’re similar in texture and flavor! This sounds absolutely yummy! 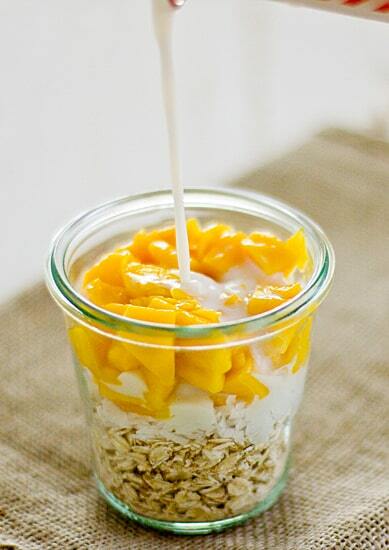 Overnight oats are one of my favorite breakfasts. About mangoes: for the regular, common mangoes, the way to avoid the really stringy ones is to avoid ones from Brazil. I’ve never had a Brazilian mango that wasn’t stringy. The ones from other places seem to be okay, although I think they all have a little inherent stringiness. Made these for today’s breakfast and my husband said, “Yummy!” after the first bite. I did add a scoop of vanilla protein powder and chia seeds (need my protein and I like how overnight oats turn out better with chia). This recipe is a definite keeper.